There was a time when parking was a simple chore. I can remember as far back as the late 1950’s living on Chicago’s West Side on Jackson Boulevard where there was not that much competition for curbside parking. Although we lived in a large apartment building complex there seemed to be more than adequate space on the street for my father to park his Plymouth. Very few, if any, of our neighbors had more than one car in the family. Diversity is a street between Belmont and Fullerton. More precisely it is smack dab in the middle (2800 north in Chicago navigational parlance) of several streets between Belmont (3200 north) and Fullerton (2400 n.) . And, as long as we are being truthful, it is Diversey and not Diversity. Tell that to all the El train conductors who used to announce the next stop along the way after the Fullerton stop to give those of us in the 1960’s a chance to switch to a B train. Of course, nowadays the human conductor has been replaced by an authoritarian robotic command. Regardless, herein lies the irony. I am not a middle child but the second of five. I don’t often take the middle ground unless it is to get someone else to compromise toward my way of thinking. I am middle aged, I guess, unless I live to 120, which is possible. One thing I enjoyed being in the middle of was the streets I lived on as a kid. Between 1955 and ’59, home to me was Jackson Boulevard in the West Garfield Park Chicago neighborhood between Kostner on the right (or east) and Kilbourn, to the left or (west). Situated in the middle of the block gave me an opportunity to roam a little further every year with more confidence in each direction without adult supervision. The moment my feet touched the sidewalk of our block on a return trip from elsewhere I already felt as if I was on the stairs leading to our first floor apartment. The only time I crossed to the other side of the street- the north side- was with my parents when the car was parked there. I was too young to play with a ball on the sidewalk out front so there was not even a chance of me running out onto the roadway to grab an errant throw. Baby boomers remember when kids used to go outside and play instead of sit in front of a computer or electronic games device. 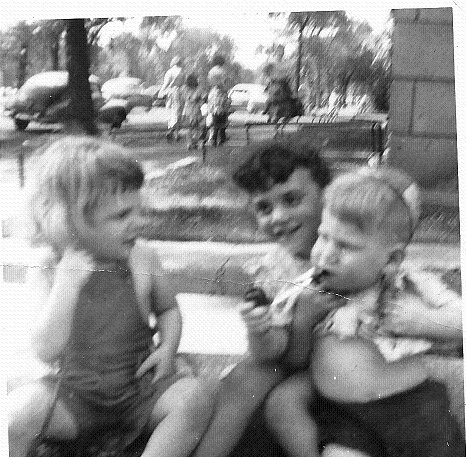 In the mid 1950’s, playing outside on Jackson Boulevard in Chicago’s West Garfield Park area meant either doing pretty much the same stuff that my year older sister did. This included hopscotch, hula hoop, jump rope and a great game for whiplash called “Red Rover”. This involved, if memory serves me right, having two rows of kids stand a few feet apart facing each other. The captain of one row instructs his or her line mate to shout out “Red Rover, Red Rover- let Tommy come over”. Then, it would be Tommy’s job to earnestly try to break through the human wall opposite him. Being the boy in this group and one of the younger ones- guess who was most often the sacrificial lamb? If you were born before the 1970’s then you most likely remember going into a small grocery store usually at the corner on the block where you lived or otherwise pretty close by. Such a store was an old-fashioned, claustrophobic emporium where in order to get something off a very high shelf the clerk used a long stick with a hook at the end. It acted like an artificial hand that magically grabbed a carton or jar without crashing or crushing it. There was also a ladder on rollers which the braver employee used to slide over from one part of an aisle to another to re-stock merchandise. The Chicago West Garfield Park neighborhood grocery store I went to in the late 1950’s was on Kostner in the middle of the block south from the corner at Jackson. This was where I bought penny candy and fed my growing baseball card habit. My favorite sweet junk was little waxed bottles with a sliver of colored water inside that was good for one quick slurp as well as rolls of paper with sugary dots on them. I ended up eating more paper than candy. Like all doting mothers, Ma has pictures of my childhood hidden away somewhere in the storage area of her basement. Years ago, I vaguely remember seeing one of me either sitting on or trying to stand next to a Great Dane dog in the empty lot next to the building we lived in on Independence Boulevard. This event probably takes place around 1954 or ’55 when I am about two years old and soon before we move further west and slightly north to the West Garfield Park area of Chicago. As I recall, at the time I have a look on my face that does not reveal whether the dog and I are buddies. I do know that today I have mixed feelings about these four-legged creatures. It seems that whenever I am within smelling distance of one (notice I didn’t say who does the sniffing) the animal barks in a language they expect me to understand. It as if they are communicating and do not understand why I don’t respond in kind. Are we brothers of a certain band from a previous life? Events of the 1950’s that I recollect are experienced in Chicago’s West Garfield Park, a neighborhood on the middle part of the west side of the city. We lived on the 4400 block of Jackson Boulevard a half mile north of the new construction underway to carve out the Congress Expressway. Years later, at the beginning of 1964, it was renamed the Eisenhower after the still-living ex-president who almost a decade earlier signed into law the National Highway Act. In the 1950’s as well as for a good part of the 60’s, the heart of the business district of West Garfield Park in Chicago is the corner of Pulaski Road and Madison Street. Madison Street is one long commercial strip inside the city limits running from Michigan Avenue at the lakefront all the way west to Austin Boulevard. From there, it becomes part of Oak Park and other suburbs further west. Pulaski Road is 4000 west or at the five mile mark from State Street in the heart of the loop. Madison Street today is still seven miles of mostly small storefronts, warehouses and office buildings.